Hey girls! 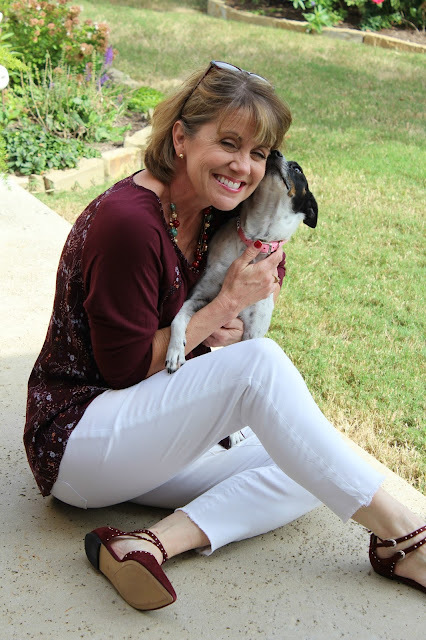 This week I'm sharing the Falling for Floral Top from Glamour Farms. Simple sweater in the front but a floral party in the back. I want to share a little about these picture taking sessions. My photographer/the love of my life is visually impaired. He really can't see me at all through the camera lens but he tries. He smiles and talks to me. He cusses fusses with the tripod and wants to help with this thing called blogging. Our pictures do not come out perfectly every time and that's ok. He'll look at this post when it goes live Wednesday and tell me I'm pretty. I look at him attempting to take pictures and I fall for him all over again. Oh did you notice the white jeans and killer shoes? I just read that not wearing white jeans after Labor Day is aging. Well heck - I'll wear them till the cows come home! Floral patterns are all the rage right now. They can provide a bright spot when dreary winter rolls around. Falling for Floral comes in wine and black with a simple look on the front perfect for a statement necklace or scarf and the back is all about the pretty flowers. If loose, flowy tops are a style you enjoy, you'll love this one. Elsie Lace Tunic Picture this with a beautiful, colorful scarf. Be sure and notice the pretty sleeves. Layer of Love Fringe Cardigan So cute and comes in black too. 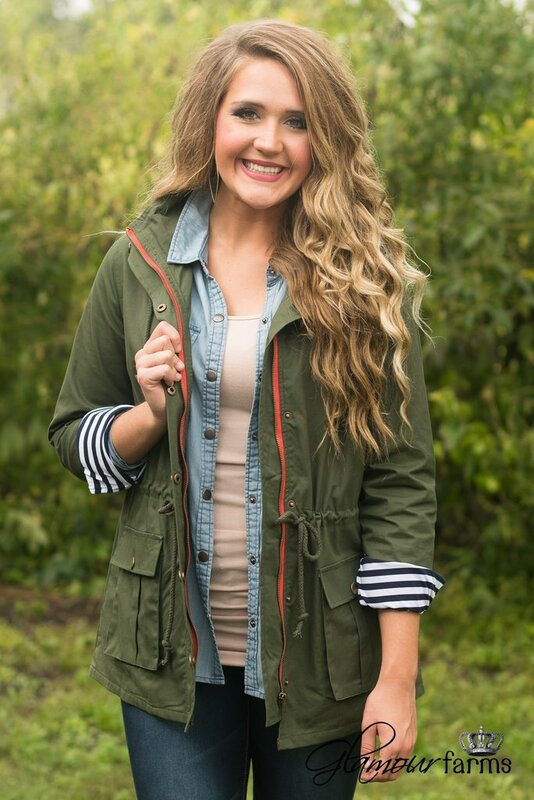 The Jane Military Twill Jacket If you don't have a jacket like this, it's a must! I wear mine all the time. Glamour Farms graciously offers this discount code to readers of my blog. 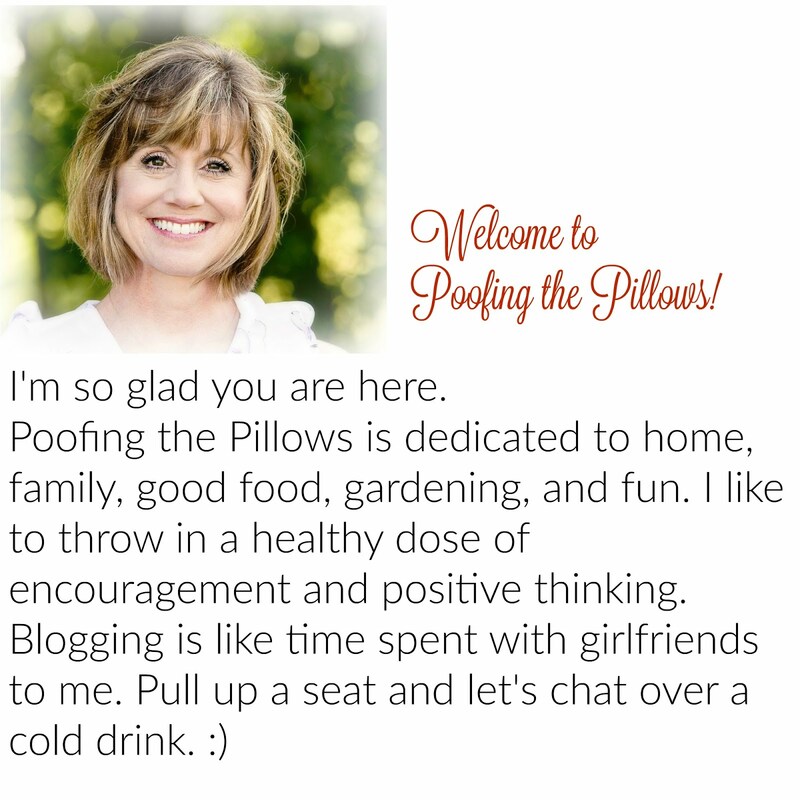 POOFINGTHEPILLOWS264 Code is valid thru 11/27/16. Code can be used one time on regularly priced items. Must be over $20. Darling top, precious sentiment, beautiful you!! I love it!! Thanks, I just ordered the fringed sweater in black, sold out in burgundy. Sad face! And an on sale top. Used your code and saved $10.00. Oh that top is stunning in the front and pretty in the back. It's like a perfect peek a boo surprise. The shoes are indeed fabulous! Love this top! You look beautiful! That us a very pretty top and I love your shoes. What a sweet post about your husband. Sounds like a jewel to me! Cute top! My sweet husband tries to help with photos too and the other day we were driving in the mountains. He saw me take my camera out of my purse and automatically he stopped the car because he knew I wanted to get a picture of the pretty colored leaves. We were in a private gated community, so there was no traffic. This is the sweetest post!! :) You look beautiful and I love that fringe sweater, too! Such a sweet post, love your top. I love what you said about your sweet hubby. And to be honest, I love these fun candid pictures. Keep it real girlfriend. I love this post. Darling shirt. It was great seeing you, today. I adore those shoes. My eyes teared up when I read what you wrote about your dear hubby, Stacey! That was so sweet!! You look adorable, as always. Stacey, I did not know that about your sweetheart. He does an amazing job and I'm sure he feels as lucky to have you as you do to have him! Perfect couple indeed. You always look so cute. The outfit is darling and those are some killer shoes!! Thanks for sharing with SYC. You are a doll and I love the outfit and wow...those shoes! You have a love of life that makes you even prettier! I know you face challenges with your husband's impairment...its never easy. I understand, believe me. Oh this post is so cute and you're so beautiful!! My hubby photographer sounds like yours....Cute top Loving the mix with the floral in the back. As always you look super cute! You and your photographer make an great team! I think you may have found a new career in modeling...darling photos! Cute top Stacey! And I love the new white jean rule! You do look beautiful, and I love your beautiful story about your husband taking photos. That top is so cute and your necklace is perfect with it. Sweet puppy too. You look beautiful!! You are so lucky to have found a kindred spirit ;) Between you and Jemma, I'm looking at clothing a lot differently these days. You should be a model for Glamour Farms! I'm so glad white is becoming acceptable year round because I think white looks great all year. Have a great day Stacey! First of all, you look adorable. And I'd say for a guy who can't see so well through the viewer that he aced those photos. Clear as a bell! 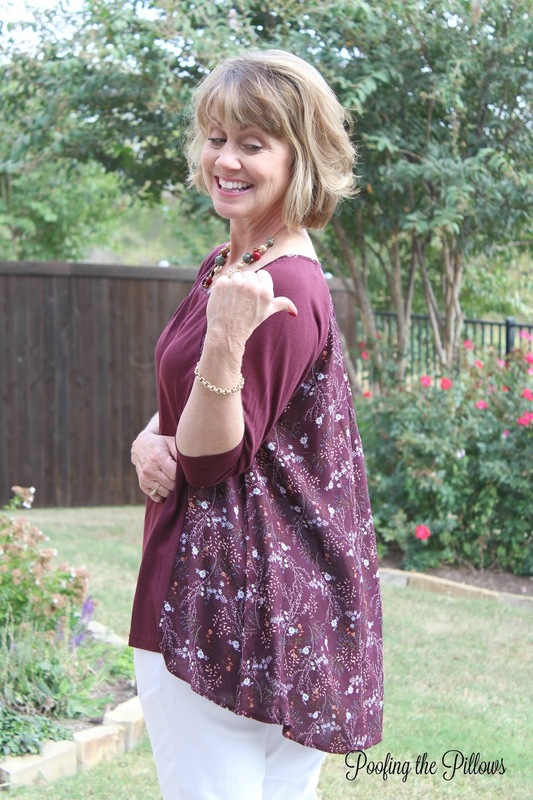 Hi Stacey, I love this floral and solid tunic. It's beautiful and you look adorable in it. Love what you said about your hubby and the picture process too. He does an incredible job. You are rockin those darling shoes too. Oh Stacey, your comments about your husband are just wonderful! I love to hear others are still in love; makes me smile! The tunic is just gorgeous - it looks wonderful on you (and I love the white jeans - who said you can't wear white after Labor Day? Stupid!) Cute shoes too! Have a great rest of the week, sweet friend! What a great post, sounds like you are very happy with the mate you have chosen for life as it should be. Love your top. I love the twill jacket -I have to see if they have my size. I can sympathize with the love of your life and I was once also visually impaired. In the past two years I had a cornea transplant and cataract and glaucoma surgery. Thankfully I now have 20/30 vision in both eyes--a miracle! Very sweet outfit! I want to wear my white boyfriend jeans but around here I would look silly! Some things just go better with white! Love your shoes. 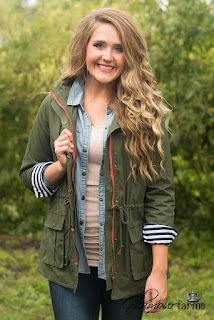 I have a similar olive green jacket and I love it. Woo hoo--just ordered the pretty fringe cardigan using your discount! gorgeous outfits and lovely emotions .